I am a professional rider. No, I don’t actually get paid for riding my small collection of two-wheelers, but I am driven by safety. When I returned to riding, I promised my wife and daughter that I would be as safe as possible. As part of that deal, safety equipment has long been a “no discussion” topic. It was given that I would wear as much safety gear as possible, as while not totally ATGATT, I manage to always wear at least a helmet, armored jacket and riding gloves. I frequently wear dedicated riding boots and have three pairs of armored pants, although they are sometimes inappropriate for the destination. I also have an excellent GoGo Gear Kevlar underlayer, and those come in handy when I want to wear normal jeans with the protection hidden underneath. I am free to purchase any safety gear that I will wear, although that often means used gear (eBay or Craigslist), and all my helmets are bargains (Motorcycle Gear, mostly). Safety and good value can co-exist! I recently stumbled across a small, inexpensive bit of safety gear that I had never heard of. The RoadID was originally conceived as a add-on bit of safety gear for runners and bicyclers. These enthusiasts typically don’t carry identification or money and often wear no safety gear. 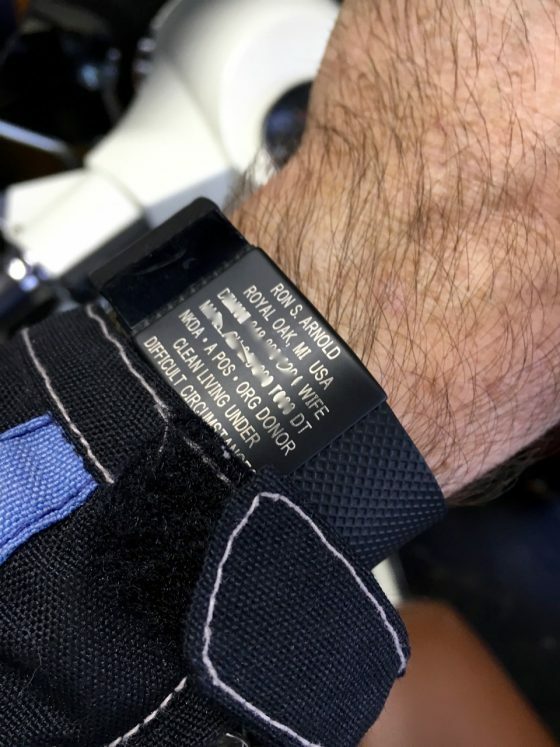 For this reason, the inventors of the RoadID, Mike and Edward Wimmer, came up with a simple way to provide needed medical and contact information for runners and bikers. The invention came about when Mike (the dad) expressed concern about how he would know when his runner son (Edward) was injured while running, especially as he was leaving the local area to attend college. After a close call with a curb-hugging truck, Edward realized exactly what he dad was thinking – how could any rescuers know his name or contact information if he wasn’t carrying ID or his phone? The answer was simple, the RoadID, a metal tag embossed with the minimum information required to provide immediate assistance – name, contacts and any medical information. This basic information would immediately help in treating an person unable to provide that information. I like the idea of the RoadID and how it goes with riding our powered two wheelers. Of course, we have to carry our identification and proof of insurance with us (or should) and we have more ability to carry other items like phones. Some of us have pre-existing medical conditions that we already wear notices of on our wrists, but the idea of having it all in one place at one time, makes a simple idea very attractive. And as a professional rider, my promise to my wife and daughter to ride safe is kept with this modest item. I ordered the FitBit compatible RoadID. It’s a specially shaped piece of stainless steel that fits perfectly on the FitBit Charge/HR, filling the dead space below the readout. During the order process I carefully considered the information that I was going to put on it and consciously decided to fill it with as much information as I could. 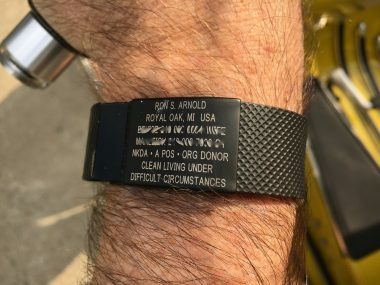 My personalized RoadID has my name, of course, my wife and daughter’s cell phone numbers, the fact that I have no known drug allergies, my blood type and that I’m an organ donor. That left the two bottom two lines to customize. If you know me, it might be an easy guess as to what I put there… of course it was legendary Mod Peter Meaden’s early description of the Mod life: “Clean living under difficult circumstances”. Other choices that RoadID suggest range from the various numbers that distance runners use and helpful statements like “Break on through” or “Keep pushing”. I think that mine is better. The RoadID is of the highest quality. It’s stainless steel, and the information isn’t just printed onto the surface as might be expected. I selected the black finish and gold lettering option and the information is engraved onto the black finish. Although it comes in a nifty metal box, it’s tough. Within the first couple of days, I had scraped it across a steel door edge and bashed it squarely into a CVT case on a scooter, to no ill effects (unlike my tested-tough FitBit). It’s been noticed by fellow riders, sort of like a decent piece of riding gear or a new helmet. People were curious about the RoadID at our local rally. Most thought that it was a good idea, especially when I explained my concept of being a professional rider. A couple of folks thought that it was overkill for a scooter or motorcycle rider, and they may be right, but considering how some riders come off losing shoes and the contents of their pockets, I’d say that it’s good at least as an ID back-up. After several month with the RoadID, I can’t say that it’s changed my life… but maybe it has. It sits quietly with me at all times. 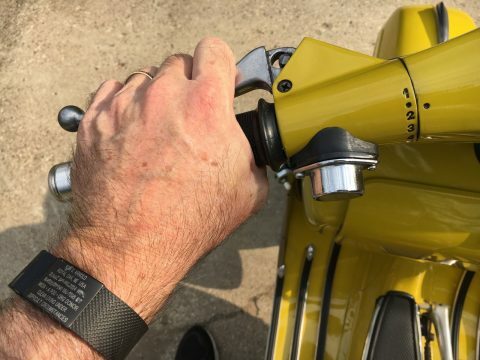 As September and October have arrived (prime riding season in Michigan), and with a cross-state ride scheduled, I’ve come back to appreciate the RoadID and now consider it essential to my continued safe riding plan. Yes, I am a professional rider, but only to my two dearest stakeholders, and I will do everything that I can to make sure that I can enjoy the exhilarating feeling of riding scooters and motorcycles while being as responsible as possible to those I love. Most scooterists would cringe at hearing of a scooter wrapped around a tree, but German sculptor Stefan Rohrer turns such frightening scenarios into wild—and not so frightening—art installations.